In simple terms, radiated EMI emission starts from an emitting source, propagates via a radiating path and reaches a susceptible receiver. The strength of the radiated EMI is determined by the source, the media surrounding the source and the distance between the source and the susceptor1…unless there are cables in close proximity to the source or receptor, in which case all bets are off. In that case you need EMI shielding tape. Electronic or electrical cables can compound EMI noise problems as they are major transmitter of stray signals. Unshielded cables can act as a conductor, sending direct disruption to sensitive equipment. They can also act like an antenna, spreading RF noise throughout a hardened enclosure. But they also act like a receptor, picking up stray EMI from other places. The best way to keep those signals contained along cabling is with EMI shielding tape. EMI shielding tape is a knitted circular strip of wire mesh that resembles a gauze tube or elongated wire stocking. It’s construction is perfect for wrapping cables where conformity is needed without adding a lot of weight or bulk. It’s flexibility characteristics make it more suitable than foil tape where cables twist or bend. Using the appropriate diameter EMI shielding tape to fit the application, cables are covered in an over-wrap fashion to avoid gaps and achieve attenuation. The wrap can then be grounded at one or both ends. Besides coming in various diameters ranging from .437” to 5.5” to form numerous possible widths for the wrap, MAJR Products offers knitted wire mesh tape in variety of metal wires. Our Sn/Cu/Fe wire, in accordance with ASTM B-520, provides 3% tin for low impedance and maximum corrosion resistance, 40% copper for maximum conductivity and 54% steel for strength and permeability. It offers superior performance characteristics in terms of pull strength (50 lbs) and elongation (100 percent). RFI/EMI shielding tape is also available in monel and aluminum wires, allowing you to choose the right material for your application without needlessly over-spending. Very few of our competitors can offer so many choices in terms of tape diameter and the material used. Don’t let those electrical or electronic cables and harnesses become a raceway for EMI noise or an antenna for picking up and broadcasting stray signals. Overbraiding with EMI shielding mesh tape is the easiest and most cost effective way to achieve the attenuation needed for a hardened enclosure. You can find more technical details and a spec download on a page devoted to knitted wire mesh tape on our website, where you can request free samples. You can also call or message our our engineers if you have questions about metal wire choices, proper diameters or the required overlap for your application. 1Xingcun Colin Tong, Advanced Materials and Design for EMI Shielding, CRC Press, Taylor and Francis Group, 2009. Chapter 1.1.2.2 “Radiated EMI Emission”, pg. 6. Every once in awhile true innovation transforms an industry. Consider what the cloud has meant for business as it brought about data storage, access and co-worker collaboration. Look at how the Internet of Things is frontiering cashierless shopping. Such champions in innovation will not only make the industry and applications they integrate with faster, easier or better, they change the way we think about what’s possible. Over time these disruptors soon become the new industry standard and we wonder how we lived without them before their introduction. For the EMI/RFI shielding industry, this transformative shift is now taking place in RF absorber materials with MAJR Products’ new MAJRabsorber™. MAJRabsorber™ not only absorbs and dissipates but reflects stray noise. Within frequencies of 1 – 18 GHz it offers attenuation levels which greatly surpass other absorber materials on the market and, in fact, within many frequencies attenuation is more than doubled. It achieves its effectiveness because of its “layered” construction. 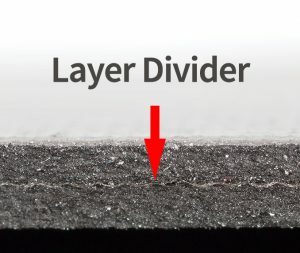 It has a flexible, inner conductive layer that is placed between two non-conductive layers, allowing MAJRabsorber™ to reflect stray signals radiated emissions and affiliated currents gathered by the electromagnetically reflective inner layer back through the non-conductive RF absorbing outer layers. This causes stray noise to reflect, much like a racquetball’s energy is quickly dissipated as it bounces from one wall to another and therefore drops to the floor. But it is not just its attenuation ability that brings accolades to this new product. The very fabrication process that gives MAJRabsorber™ those high levels of attenuation also allow it to be useful in a number of difficult applications. Because of the non-conductive outer layers, MAJRabsorber™ can be placed between close circuits without fear of shorting out sensitive components while helping isolate them.. The multi-layered approach also makes this material ultra-tough while remaining extremely flexible, which lends itself well to the production process for oddly shaped hardened enclosures, even remaining tear resistant for those difficult spaces during handling and transport. With one of the many supply options being roll form, MAJRabsorber™ is not only cost competitive but it allows for quick turn-around times when cutting prototypes and even large production runs. This becomes a game changer for strict deadlines and tight budgets. And for those enclosures which must stand up to challenging environments, engineers will be happy to note that MAJRabsorber™ is corrosion resistant and works well under both ends of the extreme temperature spectrum. Tomorrow’s innovation for today’s EMI/RFI shielding needs: That’s been MAJR Products’ mantra for 25 years. Look for MAJRabsorber™ in roll form (and quickly produced custom die-cuts), strips, sheets and pads in various shapes with no pressure sensitive adhesive (PSA) or PSA applied to one or both sides. You’ll soon see it in the most progressive military or civilian electronic engineering programs, which are hopefully your own. MAJRabsorber™: Only at MAJR Products. Hardened enclosures come in all shapes and sizes. When you compound the possibilities of various applications, industries, specifications and regulatory authorities, it’s no wonder that standard sizes, types or material for shielding a hardened enclosure rarely meet specific needs for any given project. Even though most hardened enclosures are custom designed with specific requirements in mind they often have one thing in common: They all must breathe to allow cooling of sensitive electronic equipment while also being protecting from EMI/RFI. Up until now this has been an ongoing problem for engineers. Rarely are enclosures designed to be able to use standardized products for EMI shielding and air ventilation. Long and costly waits for a specialized EMI ventilation panel prototype are only the first problem. Large production runs have been out of the question. It is almost as if the pre-existing EMI shielding vent panel dictated the size and configuration of the hardened enclosure. That’s like forcing a square peg into a round hole. Need Round, Curved or Oddly Shaped Custom EMI Vent Panels? 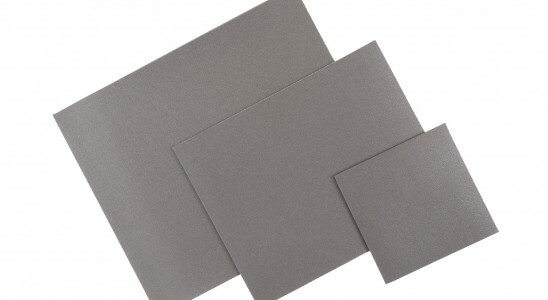 MAJR Products, however, has mastered the trifecta of shape, size and speed-to-market for Custom EMI Ventilation Panels. We are the leading EMI shielding products manufacturer that can supply specialized vent panels engineered for difficult round, curved or specialized shape requirements and still maintain a high level of EMI/RFI attenuation and low upfront set-up costs. With a simple upload of specifications from a customer, MAJR Products can produce Custom EMI Ventilation Panels estimates often within a few days and provides in house technical assistance on design concerns before parts move into the production phase. In addition, MAJR’s Custom EMI Ventilation Panels can be produced in both Honeycomb Waveguide and Air Ventilation styles depending on the shielding and airflow requirements. Custom Honeycomb Waveguide Panels are available in aluminum, brass, steel and stainless steel to meet the specific attenuation requirements of MIL-STD-461 and MIL-STD 810 by facilitating wavelength beyond cutoff. While they can be made in a variety of shapes and sizes, they still allow for maximum air flow. With integrated gasketing material appropriate for the application, these custom waveguide panels can be supplied with captive fasteners or frame through-holes mounting options. Custom Air Ventilation Panels also achieve attenuation of EMI/RFI noise while providing a minimal air pressure drop. 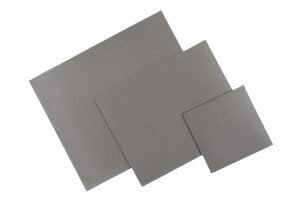 Most applications will call for an aluminum code-57 filter media and, when used with MAJR’s integrated gasket, will achieve EMI shielding to levels that meet or exceed commercial requirements. No more “square peg-round hole” restrictions on honeycomb vent panel design. Quick development and engineered to your specifications. For those openings in hardened enclosures that are beyond the limits of stock, off-the-shelf EMI shielding vents, reach out today and – contact MAJR Products! 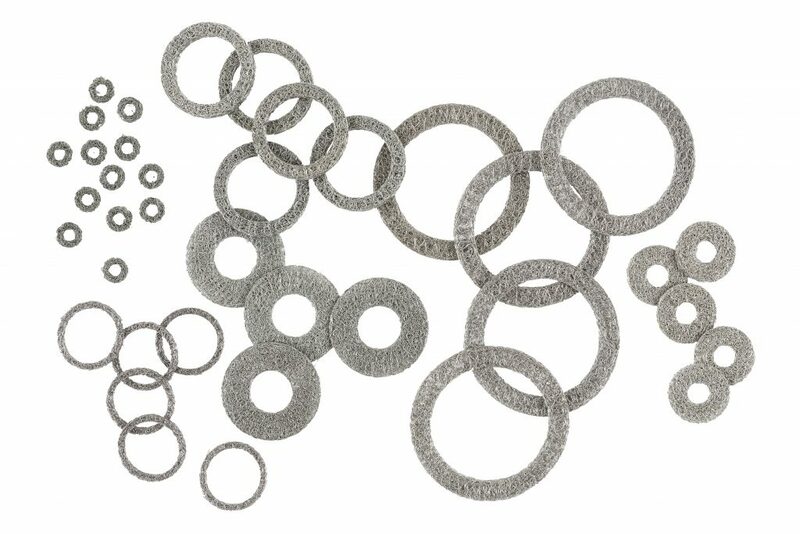 EMI/RFI wire mesh grounding washers are made from wire mesh socks that look somewhat like thin knitted metal hoses before being compressed in a die to form the washer. 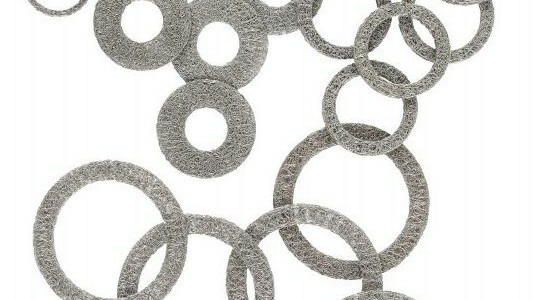 By altering the weight of the metal sock, various densities of washers can be made to increase or decrease the resilience. For example, a sock with a metal density of 15 to 20 percent will create a washer that can fill a gap or seam under pressure. 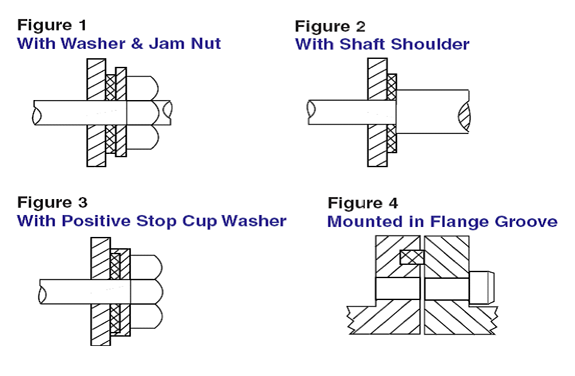 A starting density of 30 to 40 percent can create a washer which will snuggly fit a shaft or rod, which when compressed will act as a slip-ring to ground a rotating shaft to a metal enclosure. This gives the shaft needed EMC properties, eliminating unwanted EMI/RFI noise. Conductive elastomer washers for EMI shielding and grounding are molded elastomer filled with conductive particles to provide the electrical conductivity and broadband shielding. They are made of a variety of materials including silicone, fluorosilicone, or EPDM which stands up to fuel or chemical contamination. Their conductive particles can be aluminum, copper, nickel or silver, used singularly or in various compound combinations. The various conductive materials used changes the performance characteristics of the washers and, along with varying the thicknesses, allows the washers to achieve a desired hardness and operating temperature range while accommodating differing MIL SPEC M83528/012X requirements. Like their wire mesh cousins, conductive elastomer washers can be made in almost any ID or OD size. As stated earlier, the smallest details are often the most important when achieving attenuation and grounding in hardened enclosures. With so many choices of materials, applications, where they are used and differing FCC, military and UL requirements, it’s important to use the right washer made of the right materials in the right size for any specific application. There will be times when a conductive washer should be used over a wire mesh washer, or where silver is the preferred conductor over Monel or aluminum. But that’s the beauty of EMI/RFI grounding washers – they’re as adaptable as need be. For help in determining what and how to use when, please contact the engineers at MAJR Products by calling 877-625-6033, or feel free to ask questions using the form on either of our web pages for EMI/RFI Wire Mesh Washers or Conductive Silicone Washers.